The Norman Course is located in North Myrtle Beach at Barefoot Resort. The course features seven unforgettable holes alongside the Intracoastal Waterway. As a Greg Norman’s design, the Norman Course captures the strength of its surrounding by using native plants, waste areas, and undulating greens to highlight each hole. The course is a playable challenge for any golfer. Approximately 7,200 yards long and a par 72, the Norman Course resembles layouts in the Southwest but without the dessert. Bunkers are sod walled and sloping, similar to a MacKenzie style golf course. The “bump and run” allowing golfers to play a number of different shots is Norman’s views and evident in the course design. The tees and fairways are landscaped with GN-1 turf. The approach areas are Tifdwarf grass. Champion UtltraDwarf Grass resides on the greens. No golf vacation would be complete without playing the Norman Course. 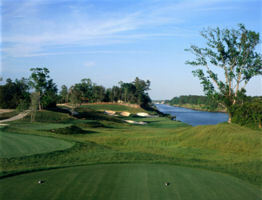 The Norman Course is located in North Myrtle Beach at Barefoot Resort.